Aspinalls - Co-Tech Copper Foil Corporation - UK Engineering Experts | Engineering Business UK | Qualified Engineers Lancashire | Mechanical Engineered Products | Mechanical Engineer Services. Since their formation in 1998 Co-Tech Copper Foil Corporation of Taiwan have been placing major contracts with Aspinalls for our range of copper foil production equipment. In this latest project Aspinalls supplied state-of-the-art electrodepositioning equipment as Co-Tech yet again expanded their manufacturing operation. Located in the heart of Taiwan in the city of Touliou, the Co-Tech factory is now one of the largest single site copper foil production facilities in the world. 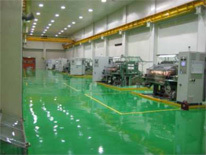 The equipment designed according to Aspinalls latest technical innovations was manufactured in Europe and shipped to Taiwan in early 2008. An installation team from Aspinalls was deployed to commence site installation in July 2008 with full commissioning of the equipment being concluded in December 2008.